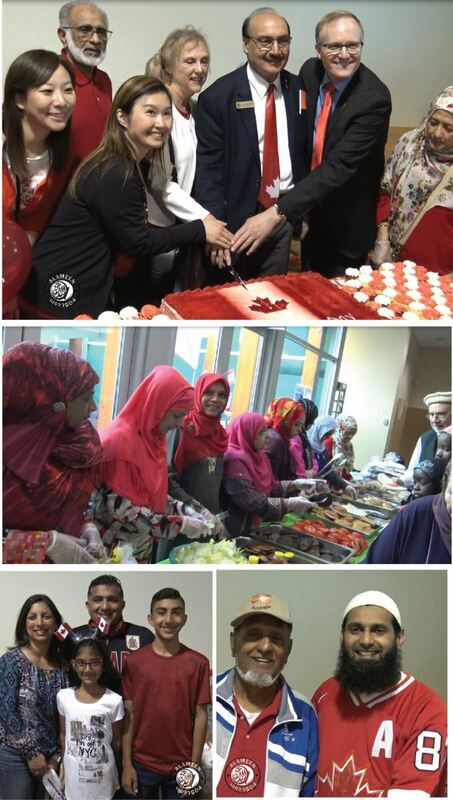 Muslims in British Columbia completed fasting month “Ramadan” on June 14th. 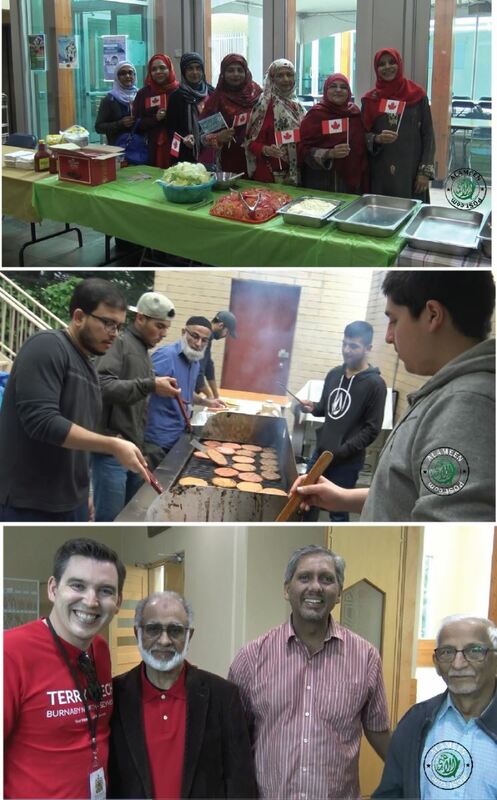 Masjid Al-Salaam & Education Center, Burnaby organized a public event on July 1st, 2018 to celebrate Eid Al Fitr (end of Ramadan event) as well as 151st Canada Day where entire community from lower mainland participated in the day filled with joy, activities for kids and delicious BBQ lunch. The Masjid was specially decorated for the occasion; and approximately 900 people visited the Masjid between 11:00 am to 4:00 pm. A tour of Masjid sections were also provided to the audience and people were impressed with the Islamic Architecture and welcome from the community. Children thoroughly enjoyed the bouncing castle, balloons and ice cream during sunny day and approximately 1,000 BBQ burgers and meals were served. 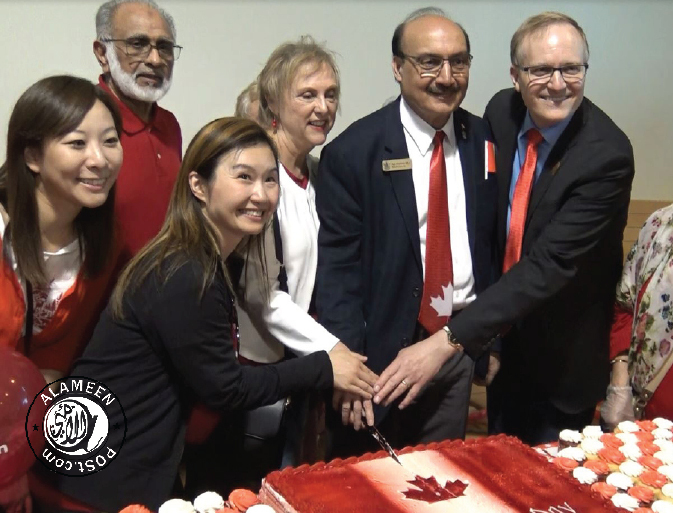 The following dignitaries joined the community at Masjid for the celebration; sang the national anthem O’ Canada with the audience followed by cutting a huge cake. Daud Ismail – Director of Masjid Al Salaam thanked the MP, MLAs and audience for celebrating Canada Day and Eid at the Masjid. “Assalam-o-alaikum – Happy Canada Day to All Muslim Canadian! Today is the day we celebrate our diversity, we also celebrate the enormous contribution the Muslim Canadian have made to Canada - our country, to which we are very proud. We still have much work to do, we need to fight back against Islamophobia, and we need to make sure that every Canadian feels at home. Mohamed Shameen - Chairperson of Masjid Al Salaam thank the community, visitors and in particular volunteers for making it a memorable, successful and enjoyable event for all.